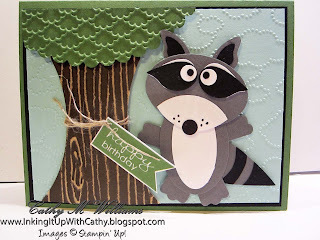 Here is a card that we made last month at my punches class. I have to give full credit to the creative artists who figure out that they can make something like this adorable raccoon from punches! In this case, Trudy Freas swapped a card using the raccoon at a Punches Swap at Convention. My twist? I added a tree made from the scalloped circle from the Circles Collection framelits. The trunk of the tree was made by cutting off the sides using the Ovals Collection framelits. I then embossed it using the woodgrain embossing folder. The paper was the Early Espresso Core'dinations paper so we were able to get the two tone look on the trunk. My Friend .... From Stampin' Up! Technique Tuesday - Tie the Perfect Bow!